In one of the hotbeds of cross country prep talent in the nation, the 52nd Orange County Championships takes off this Saturday at Oak Canyon Park. Held next to Irvine Lake in the east hills of the county, this will be the second year held at this venue after decades of competing at nearby Irvine Regional Park. The two-day affair begins with the smaller and medium schools competing on Friday afternoon. With the traditional ebb and flow of October's weather here in Southern California, it's expected to be in the low 80's on Friday afternoon, but should be overcast and in the 60's for the larger school and Sweepstakes races on Saturday morning! Several solid squads have opted to compete on Friday including the girls from Brea Olinda, Corona del Mar, Laguna Hills and Santa Margarita. All four are projected to either qualify for the State Meet next month or are right on the cusp to do so. CDM was 10th at last year's Division III state championships. Laguna Hills was 14th at State after winning the Southern Section D-III crown a week earlier. The boys from Servite have shown some nice improvement while St. Margaret's continues to be one of the top Division V programs in all of California. Both of their squads are projected to make the podium at next month's state championships and be right in the mix to capture state titles. 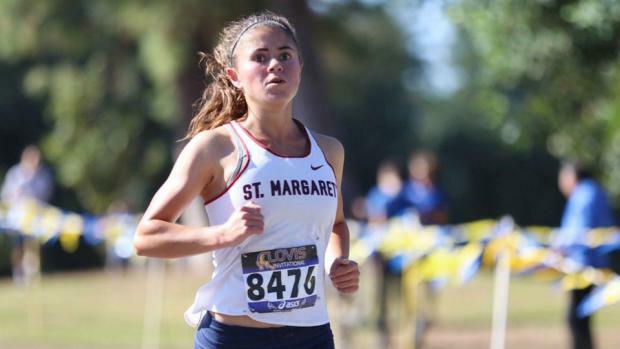 St. Margaret's girls were fourth at the 2017 State Meet with the boys taking seventh. Amelia Kang and Andi Carnell (pictured) are two of the county's best, both rolling to sub-17:30 performances at the Cool Breeze Invite a month ago. With Friday serving as a nice warm-up, that only leaves us with the Saturday action-packed Sweepstakes Races that decide which squad will walk away as the 2018 Orange County Champions!